Watch out for a different kind of wedding fair experience ... Cake & Earl, a beautiful eclectic showcase and fashion show with a mix of stunning modern and vintage wedding dresses and everything you need for that special day in your life .... with a twist! For more information contact www.sugargroup.com. 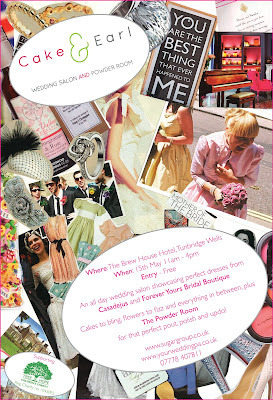 The event took place at the Brew House Hotel and the Old School House in the picturesque old town of Tunbridge Wells. Brides-to-be sporting goodie bags provided by Hoopers were spoilt for choice of jewellery, wedding accessories, gorgeous gowns, silk underwear, make up and hair tutorials, massages, flower arrangements and a catwalk show. Entry was free and the event was in aid of the Tree of Hope Childrens Charity. My two beautiful models Kate - wearing Freya von Strapp PAPER COUTURE designs, a flurry of white tissue paper - and James wearing black shorts, original Austrian knitted knee-high white socks, white shirt with cufflinks, a white vest and a black tailcoat.